With a 75% similarity score, the BJ's Wholesale version of Oral-B floss is the closest dupe of this floss we have found. It is just as comfortable between the teeth, but Oral-B glide is noticeably mintier and thicker. We don't want to worry about the floss breaking between our teeth. The most gentle, but not most durable. Brandefy compares generic brands (e.g., Berkley Jensen) to name brands (e.g., Oral-B) to show you when the store brand is as good as the name brand, and to warn you when it is not. Our purpose is to help you save time and money, and to have a good time while doing it. We try to keep our dentists happy, but flossing is not fun. The only way we'll do it is if we have a gentle floss that doesn't hurt our gums. Enter Oral-B Glide. This product is as gentle as they come. Until now, we had not found a generic that mimics this smooth string. We really like the BJ's Wholesale version for how smooth it is. That is of utmost importance to us. The differences in the two, however, are noticeable. 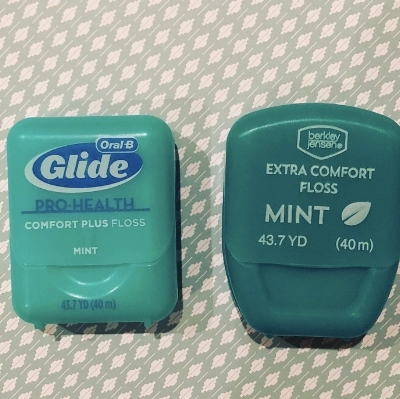 The Glide floss is much mintier and the floss itself is stronger. The Berkley Jensen did not break on us, but it was so thin it felt like it could. This is something to keep in mind if you are considering the switch. We are currently using both brands and trying to keep the cavities at bay!